I think I was aged 7 or 8 when I first came to Phuntsholing town. That was the biggest city I had ever seen in my life. After having grown up in a remote community of Dipujhora (Damzhagsa) under Chengmari Gewog in Samtse, the scene of Phuntsholing town was something I had not even imagined in my dreams. I was so excited to see so many beautifully painted buildings, different cars and bikes running in different directions weaving a beautiful tapestry of daily life, and numerous shops lined up along the roads. The good thing was that I was still able to see at that time and I had the full privilege of enjoying the real beauty of the entire town with my own eyes. When we first moved out of my village, I felt very scared even when a roaring tipper-truck approached us in Chengmari market. I nearly ran away when the truck stopped before us. I didn’t know that my father had actually waved at the driver to stop. My father dragged us all into the truck and that’s when I realized we were going somewhere else. We got down in Samtse and after spending a few days at my uncle’s house, we left for Phuntsholing. It was here that I saw the picture of a real town. Samtse town was not even a town at that time with only a few shops and buildings. The goal-building was the first feature that made the town distinct from that of Samtse. It was the tallest building during that time and I know it remained a symbol of Phuntsholing town for a very long time. 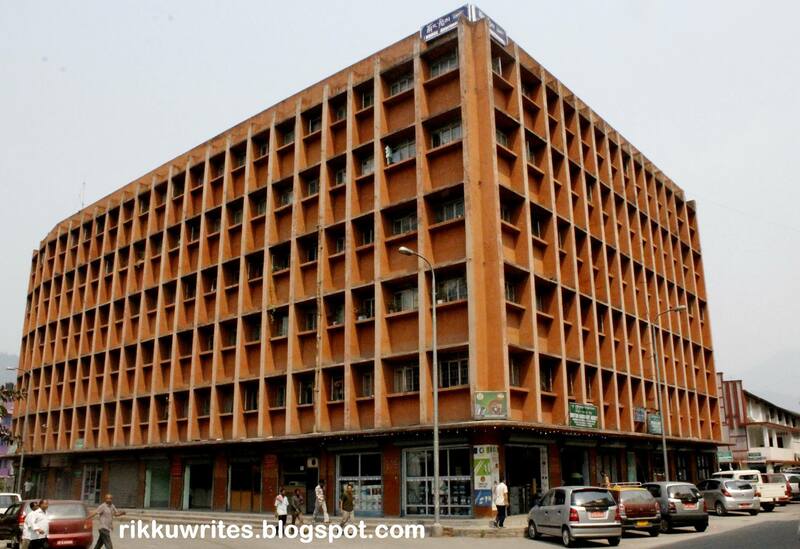 My elder half-sister had been working as a house-maid for a manager of the company under which my father was supposed to be employed in charcoal production and she was living with them on the 3rd floor of this building. She had been working for them for a while and she was very familiar with the town. Because of her, we got the opportunity to live in this building for about a week until the work for my father got finalized and his placement in Bunagu under Chukha Dzongkhag got confirmed. While we were there with her, she took us around the town and helped us do shopping. The memories of those hotels with nicely arranged shelves packed with fruity-juice packets, biscuits, sweets and many other tantalizing lines of eatables still linger in my head afresh. I think it was summer because I remember ceiling fans rotating in every shop or hotel we entered. Outside, it was amazing to see different types of cars, motor-bikes, bicycles, trucks and buses. The Maruti vans which looked like small buses appeared so cute that I would even imagine driving one of them myself. The large buses that arrived at and left the bus station were huge and heavy with their windshield divided into two portions like the goggles. I and my sister used to say the right-side of the windshield was for the driver and the left-side was for his handiboy. I heard that today’s buses do not have that kind of windshield. Another clear memory of Phuntsholing town is the artificial elephant which stood on the road-side near the old bus station. It looked so majestic and beautiful. I don’t exactly remember its color but I think it was green. I am not sure if it still exists today. There was a building covered on one-side with bamboo mats and people told us it was Tashi Commercial Store. We went around each and every corner of the town, exploring its beauty and grandeur. It was lovely to see men riding bikes with helmets on their heads and women seated behind them with their beautiful Sarees flapping in the air. I really enjoyed my short stay in Phuntsholing town not knowing that I would not have the same privileges when I return in a few years’ time. Well, that was the last time I ever saw Phuntsholing. When I returned next time, it was on my way to Khaling and I could never see the things I had seen before. I still imagine that the town will be as beautiful as it was before whenever I cross Phuntsholing although I know it would have undergone a drastic transformation over the years. Well, it took me back to 2000. I ran. When I saw vehicle for the first time in my life.